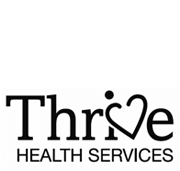 Thrive Health Services fills a gap in health care by providing evidence-based, integrative health information in the form of trainings and workshops targeted for health and fitness professionals as well as in corporate settings. Drawing on the deep educational and research backgrounds of the principals, Nicole Culos-Reed and Lauren Capozzi, Thrive Health Services teaches clients how to be more effective health leaders so they are better able to manage their health challenges, can affect positive health behaviour change in others, and are able to thrive. 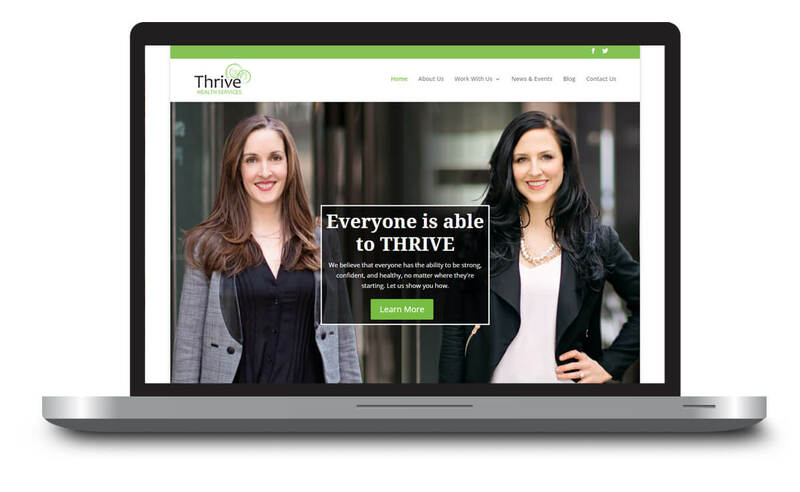 Thrive came to me at the beginning of their business. We started with a Creative Roadmap, a document that’s part strategy, part action plan, and designed to harness an entrepreneur’s ideas, identify opportunities, and create a route to reach goals. It is so nice to have this structure that helps to support our thoughts and how we can best take steps towards our goals (otherwise we get lost with so many great ideas and plans… and not a clear strategy!). The next step was to create the Thrive visual identity, so the first thing we did was to set up a shared Pinterest board to gather ideas and inspiration. It became clear early on that we were seeking a feeling of clean design and fresh, alive colours, particularly the colour green. 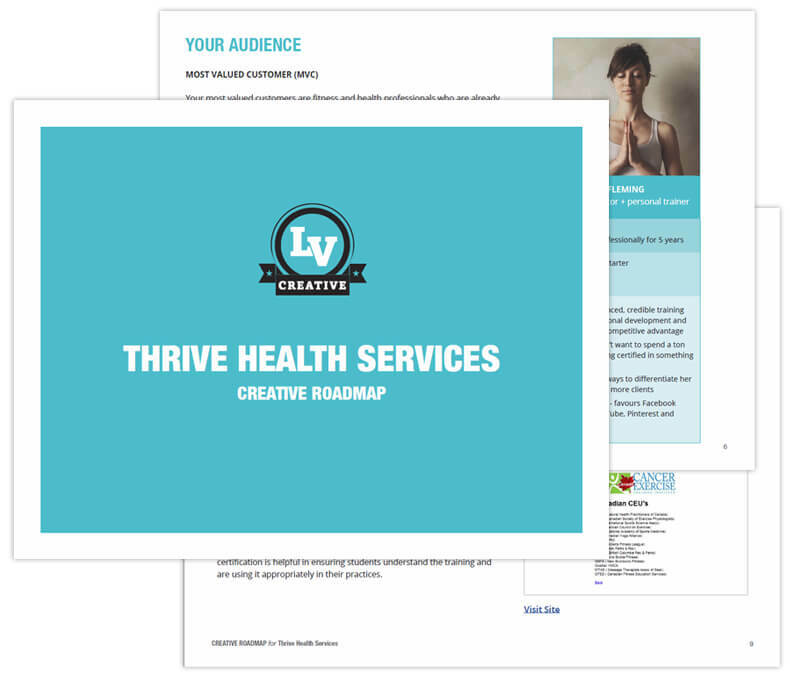 The competitive analysis done in the Creative Roadmap showed us that most health organizations were quite technically or academically focused. 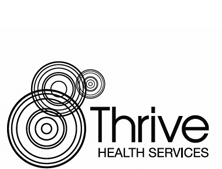 We wanted to position Thrive Health Services as friendly, approachable, and providing content that was beneficial to all. All these ideas, as well as elements of mindfulness and growth, were incorporated into our initial logo trials. 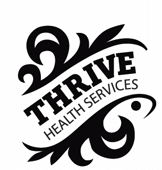 Ultimately, we settled on a logo designed around the idea of ripples, suggesting how the health and wellness training provided by Thrive has effects across many areas of the recipient’s life. 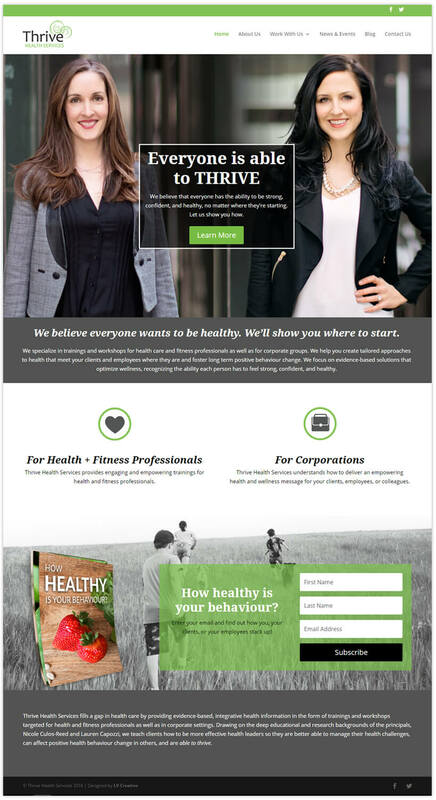 When building the website, we wanted to capitalize on the personal brands of Nicole and Lauren, as well as present approachable, friendly faces to the audience. We integrated professional photography showing the two principals both as business people and as people who “walk their talk”. The result is that audiences ultimately see the company as professional, a reliable, educated source of information, and a place to find enjoyable, dynamic training.